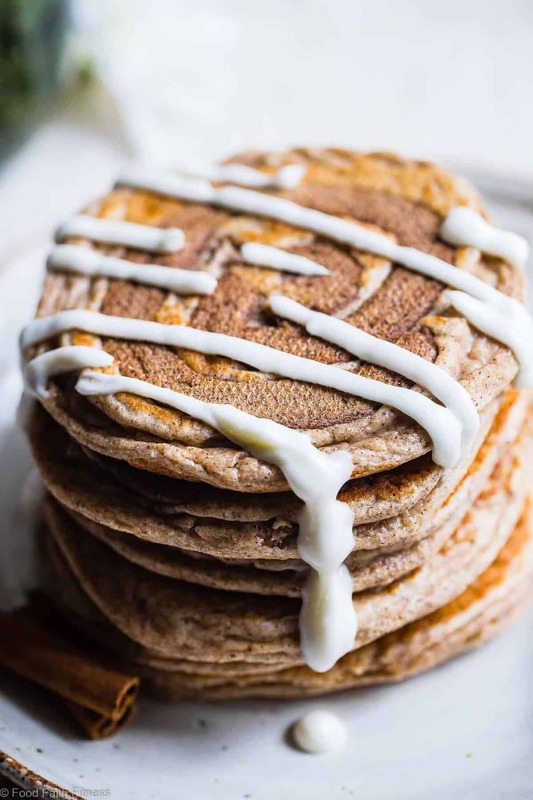 This EASY Cinnamon Roll Gluten Free Low Carb Keto Protein Pancakes recipe is going to be your new favorite breakfast. Who doesn’t want to wake up to cinnamon rolls?! You say “pancakes” and I say I AM IN. It doesn’t matter what other things you asked, the answer is always yes. Mr. FFF could say “you’re going to make me a sandwich? Pancakes.” And I’ll JUMP AT THE CHANCE. Just kidding. He is VRY self-sufficient and he never asks me to make him a sandwich. It was just the first example that popped into my brain. ESPECIALLY if you say “pancakes” combined with CINNAMON ROLLS. TUFF and STRONG, on account these being low carb HIGH PROTEIN pancakes. I can BASICALLY see your muscles growing THROUGH THE SCREEN. The amount of cinnamon that I can eat is borderline disturbing. You never want to see me eat a bowl of gluten free cinnamon roll overnight oats or cinnamon roll protein oatmeal because it’s pretty much just a sludgy pile of brown cinnamon mixed with a leeeettle bit of oats. Mr. FFF still makes fun of me EVERY TIME I eat it. You think he’d get over it after almost 6 years of marriage. You like what you like YOU KNOW? And this gluten free low carb keto protein pancakes recipe? I LIKE IT A LOT. 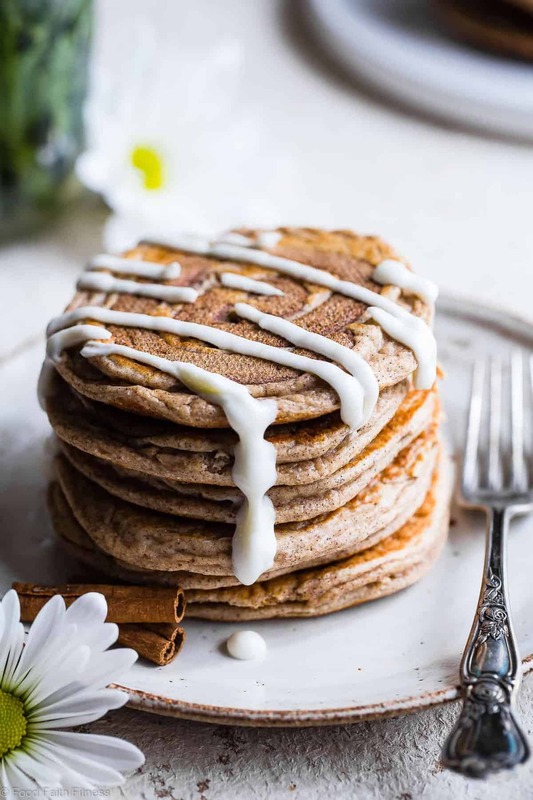 Making pancakes with protein powder is similar to regular pancakes, where you mix the dry ingredients and wet ingredients separately, and then whisk them together just before cooking, but you just swap in protein powder for some of the flour. You also will want to increase the butter/oil in the recipe, as protein powder makes pancakes VERY DRY. Have you ever tried SUPER simple protein pancakes that are just eggs and protein powder? 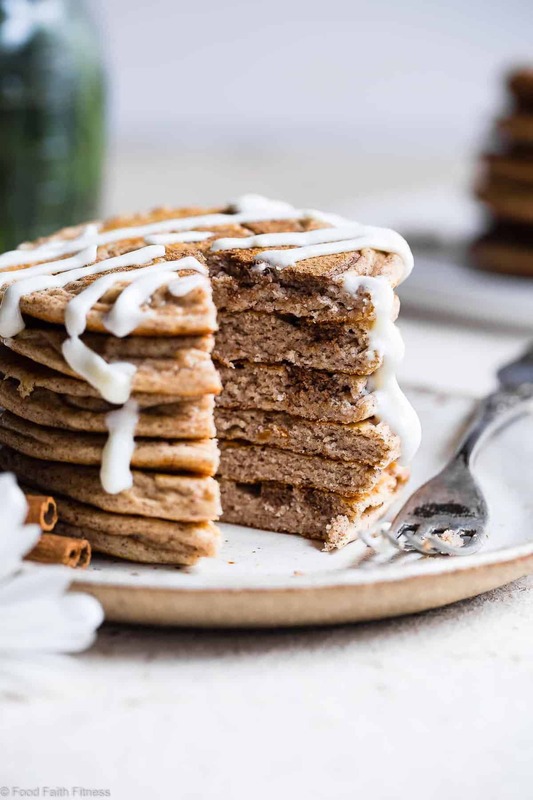 You’re, liiiike, SO PUMPED to GO TO TOWN on this golden-brown stack of BLISS and then you take a bite and it’s like what you imagine eating THE SAHARA DESSERT would be like. No amount of maple syrup can save you from that kind of BAD breakfast situation. 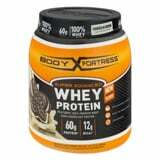 What can I use instead of whey protein powder? 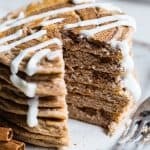 I haven’t tried this Gluten Free Low Carb Keto Protein Pancakes recipe with any other kind of protein, but I ASSUME you can use a dairy-free protein, and dairy-free yogurt. I just don’t wanna tell you FO SO. Then you’re about to meet you new breakfast BFF. Honestly pancakes with frosting are going to be the thing you didn’t know you needed. Why have been eating pancakes with SYRUP? Or with sugar. 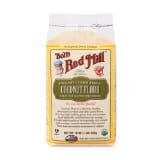 I confessed this to you in last month’s healthy gluten free paleo sweet potato pancakes. 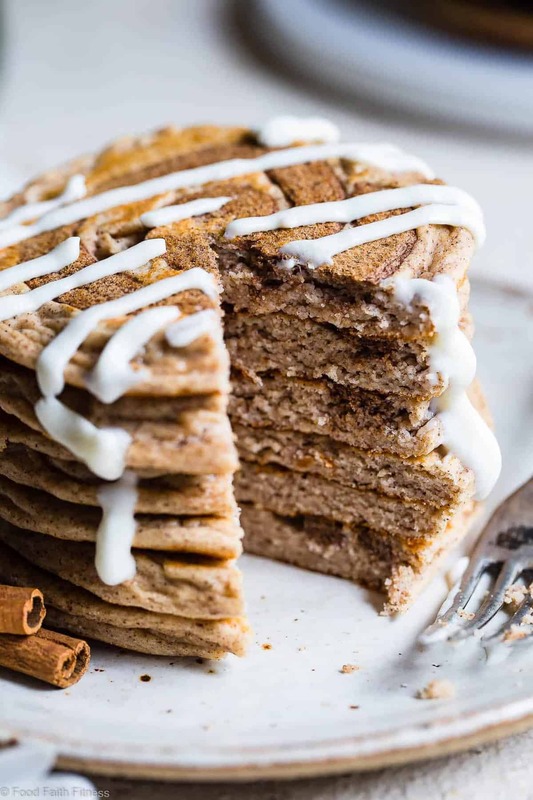 Can we also talk about the fact that we’re using protein powder to create CINNAMON SPIRALS OF GOODNESS in these Gluten Free Low Carb Keto Protein Pancakes? Like, HOLY, move over healthy protein powder cookie dough, because this might just be the most genius way to use powdery protein this side of the milky way. These little golden gems of protein and general goodness are going to be lighting up your morning all week long, just telling you RIGHT NOW. 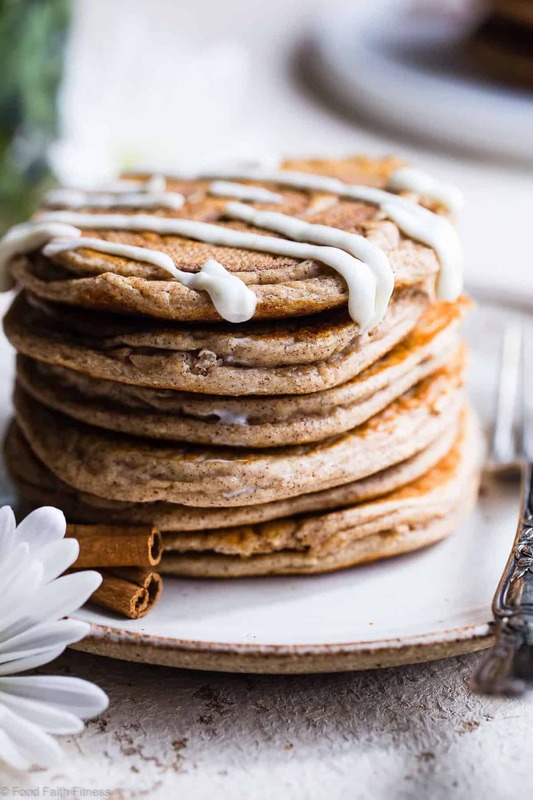 This EASY Cinnamon Roll Gluten Free Low Carb Keto Protein Pancakes recipe is going to be your new favorite breakfast. Who doesn't want to wake up to cinnamon rolls?! In a medium bowl, whisk together the protein, cinnamon and monk fruit for the filling. Stir in the water until smooth and combined. Scoop into a small ziploc bag and cut a small tip off the end. Set aside for later. 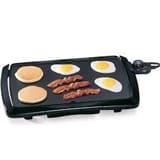 Heat up a good, non-stick griddle to medium heat (about 300 degrees) and rub with ghee. In a large bowl, whisk together the protein, coconut flour, monkfruit, cinnamon and baking powder. In a separate bowl, whisk together the egg, yogurt, milk and ghee. Pour into the flour mixture and stir until well combined - the mixture will be much thicker than normal pancakes. Use a scant 1/4 cup, pour the batter onto the heated griddle and spread out slightly (they should be around 3 inches wide) You want to keep this a little bit smaller than normal so they flip! When the edges begin to set (about 30 seconds-1 minute in) pipe a spiral of the protein/cinnamon mixture on each pancake. Leave about 1/4 inch space on the edge of the pancake so that filling doesn't just slide out onto the griddle! Cook until golden brown on the bottom, about 3-4 minutes. Gently flip and cook until the other side is golden, another 3-4 minutes. While the pancakes cook, place the cream cheese in a medium, microwave-safe bowl and microwave until the cream cheese just begins to melt, only 5-10 seconds. Whisk in the monkfruit, followed by the milk until smooth. You'll need to put some muscle into whisking to get it smooth! Serve covered with the cream cheese and DEVOUR! *Please weigh your flour and protein to ensure results. ** the amount of water you need can vary based on your protein. You want the consistency to be soft and squishy, but still a little thick and not runny! Yes please! I would love to have this for breakfast. I love cinnamon rolls and this looks like a way healthier and protein packed alternative! Pinning right now. Thank you for the pin! I hope that you love them Marie! These sound way too good to be healthy! YUM! Haha believe it girl! Thank you! Love that these are keto! I’m definitely putting these on my list to make! wow these pancakes sound delicious!! Love the idea of cinnamon roll pancakes!! Genius! These pancakes look too delicious to be healthy! I’ll have to give them a shot this weekend! I hope you love them Danielle! What a great recipe! I want to try making more simple recipes such as pancakes, salads, cake, cookies, and even cupcakes! YUM. Cinnamon rolls though–those are the best, but they can be pretty complicated! I want to try making vegan protein pancakes again since it’s been way too long! I love me anything cinnamon roll too girl! You would love these! Im 4 months in to my fitness journey and 17lbs down only 14lbs to go until I’m at my ideal weight. Im only just starting to track my macros ans rrally struggling to get enough protein – especially at the weekends when I’m less rigid with my meal prep and planning. These look like a fab way of stacking up on protein but still having a treat! These pancakes look like they would be perfect for christmas morning. Delicious! Oh yes! SO perfect for the holidays! Thanks! This looks like such a delicious breakfast, good for you too! I love me some cinnamon rolls so these pancakes are a winner for me!! Then you totally have to try these Chris!! Dang lady, you covered the health food gamut with these! Such a delicious looking stack! 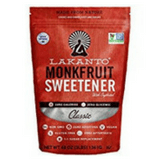 I have some monkfruit hanging out in ma pantry – now I know what to use it in! Hi, This looks like such a delicious and healthy breakfast. I’m definitely putting these on my list to make!Thanks for the sharing this. These have been a brunch staple in my diet, thanks so much. I am so glad you love them!! thanks for letting me know! We made only the pancakes, delicious. Topped them with fresh blueberries and strawberries. Will try the filling and topping next time. A really good keto recipe, thanks Taylor. Sorry I neglected to hit the stars, this one definitely gets five!